Germany’s special ties with Russia give Berlin a crucial role in trying to solve the Crimea Crisis. But that doesn’t mean that Berlin alone can push Moscow to alter its stance, as some media reports insinuate. Reading analytic pieces by influential international press outlets these days ( here, here, and here) one gets the impression that Berlin is the sole arbiter on Russia and can somehow just wave a magic wand that will make Vladimir Putin reconsider his actions. It's a catchy idea whose only problem is that it is overly simplistic and thus wrong. To be clear, Germany has a unique relationship with Russia. As the EU's largest country and biggest economy situated in the center of Europe, it is only natural that Berlin would play a key role in any discussion between the EU and Russia on how to overcome the current crisis. Beyond that, Germany's own experience in dealing with its eastern half after the fall of Berlin Wall and its close economic and political ties with Russia give it added clout and a big stake in the crisis. Germany imports roughly 40 percent of its oil and gas from Russia, which makes it Berlin's largest energy supplier. But it's not just Germany that needs Russia. The dependence is mutual. Germany is Russia's third largest trading partner; some 9 billion euros in direct investments and more than 6,000 German companies active in Russia play an important part in the Russian economy. Notwithstanding that influence, Berlin is simply not the singular external player with the power to persuade Russia to rethink its game. It does not have the economic and political leverage to unilaterally make Moscow change tack anytime soon. 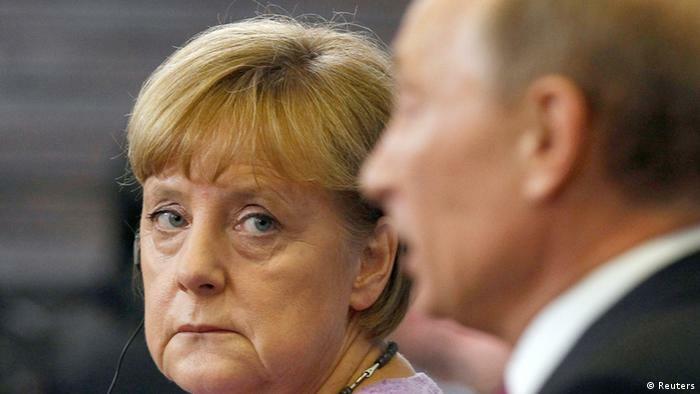 Imposing economic sanctions would not only hurt Russia, but also hit the German economy, Europe's growth engine. What's more, sanctions would take time to have an impact, and as important as Germany is economically for Russia, only concerted Western sanctions would do the trick. "I don't think Germany alone can do this," James F. Collins, US ambassador to the Russian Federation from 1997 to 2001 told DW. "Honestly, Putin is the only one who can make this crisis go away and he has been remarkably resistant to listening to anybody," noted Olga Oliker, a senior Russia expert with the Rand Corporation in Washington. While both underscored Germany's central role in solving the Ukraine crisis, they dismissed the narrative that Berlin in and of itself could influence Moscow to change course. "Germany will need to bring along colleagues in the EU and be part of a larger community to be influential," said Collins. "And I think it will also be influential to the extent Washington and Berlin are on the same page." The claim made in recent press coverage that the US has abdicated its leadership role on Ukraine to Germany is as naïve as is the idea that we are on the brink of a "Russo-German Europe." The more sober, if less juicy description, of how Europe and the US deal with Russia and the Ukraine is that of close cooperation that involves a division of labor as evidenced this week. While German Chancellor Angela Merkel discussed the crisis with Polish Prime Minister Donald Tusk on Wednesday, US President Barack Obama hosted Ukraine's interim prime minister in a high profile Oval Office meeting. And in what has been billed as a last chance to avert a further escalation of the crisis before the Crimea referendum, US Secretary of State John Kerry met his Russian counterpart in London on Friday. "The reality is it's a kind of complimentary activity," said Collins. Washington is deeply engaged in the Ukraine crisis diplomatically and militarily. But the fact is that Ukraine and Crimea are simply not geopolitical priorities for the United States and that Washington's economic exposure to Russia and the region is considerably weaker than that of Germany and the EU. "For the United States Ukraine is far from a vital interest," notes Oliker. "For Europe and for Germany it is much more of one due to proximity, due to gas pipelines and due to just a much closer economic relationship with Russia. For the United States it's a matter of principle and certainly Europe as a whole is a vital interest of the United States." Neither Germany, the EU nor the US have a silver bullet that can coerce Russia to change course on Ukraine anytime soon. In the long-run however, a joint, coordinated effort that may well involve meaningful sanctions by all three parties is the best option to make Moscow reconsider its game.